If you're keeping close track of your budget, you might want to set aside a cash account for some of your purchases. Quicken makes it easy to set up and use cash accounts, and you can transfer funds to and from these accounts and others. Having a cash account allows you to compartmentalize your money. If self-discipline isn't your strong suit, this can come in handy. Gone are our grandparents' days when most people had just two bank accounts: checking and savings. One was for spending and the other was for a rainy day. If you're operating like that, you might find that money doesn't always find its way to your savings account as you intended it to. You pay your monthly bills and for discretionary items out of your checking account, and it may seem like that account balance invariably falls pretty low while your next paycheck is still out there somewhere on the horizon. You can separate your must-pay bills from your discretionary spending when you set up a cash account. The must-pay expenses can continue to come out of your regular account. "Extras" will come out of your cash account. You can divert a reasonable portion of your income there, and should that account fall empty before your next payday rolls around, you'll at least have to think about whether you want to dip into your regular account for your next splurge, no matter how large or small it might be. Or you can bite your lip, postpone the purchase, and stay on budget. Cash accounts are also great for managing kids' allowances and for keeping track of job-related expenses and flexible spending account expenses and reimbursements. The account setup window should pop up. Select "Cash" under the account category of "Spending," then click on the "Next" button at the bottom right. Name the account so you can easily distinguish it from your other accounts, especially if you'll be setting up multiple cash accounts for different purposes. Quicken automatically provides the name Cash Account, but you have the option of selecting that or changing the account name to something else. Click "Next." Enter details for the date you want to start using the account and the amount of cash that you have on hand and will be tracking in this account. The date to start tracking will default to today's date, but as with the account name, you can accept that or change it. Remember that this is "physical," extra cash, not money in another account that you've earmarked for other purposes. Click "Next." Quicken will tell you that the account has been added. At this point, you can click on "Finish" at the lower left to go back to using Quicken. If you want to set up another account, whether it be a cash account or something else, click on "Add Another Account" instead to go back to the beginning of the account setup process. Your new cash account will now show up on the left in the account bar under the "Banking" category. This tutorial works for Quicken 2011 and more recent editions, and it should also provide some guidance for earlier versions. The steps for Quicken 2010 are virtually identical to Quicken 2011. Quicken's 2016 and 2017 versions differ mostly in the enhanced number of accounts you can add, but Quicken 2017 substitutes a plus sign (+) for "Add an Account" at the bottom of the account bar. 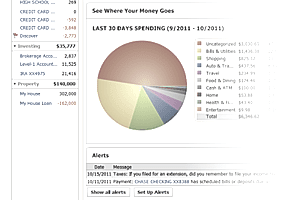 You'll find "Account Types" below "Spending & Saving" on this version. From there, the on-screen instructions will guide you along.